At a time when we usually look forward to the hot summer months with the smell of freshly mown grass and the lazy hazy sound of leather on willow, hay-fever can turn the summer months into a hellish time for regular sufferers. Going outside is fraught with anguish. The symptoms start; itchy, swollen, streaming eyes. Blocked, stuffy and sneezy nose. Often feeling lethargic and muzzy headed; not being able to think straight. Start by taking a spoonful of your most local honey. Contact your nearest bee-keepers association to find out who is keeping bees closest to you. The rationale behind this is that by taking honey foraged from the plants closest to you, your body is exposed to the pollen grains in small regular intervals. This way you become accustomed to them before they are released in millions into the air during the allergy season. By means of this simple intervention you may then not re-act so dramatically next time because your body does not regard them as such a threat. By preparing your body to do battle, make sure your constitution is as strong as is possible before the onslaught of your allergy season. It is different for different people. For some it is the fungal spores which are released early in the autumn, for others it may be the willow buds that ripen in the spring, but more often it is the grass pollens that are released in the early summer months. Make a note of when your symptoms start and tail off so that you know your enemy! Put yourself onto a pre-allergy regime for four to six weeks in advance. Get more sleep, perhaps go to bed an hour earlier, drink more water so that you are well hydrated. Cut down on refined sugar and carbohydrates. Watch your diet and eat plenty of fresh fruit and vegetables. This way your body’s reserves of vitamins and minerals will be topped up and ready to commence battle. If you can strengthen your system before the allergic response is triggered it is much easier to effect a change than waiting for the symptoms to commence then trying to combat them. So the secret to combating allergies is to know your enemy, and then prepare to do battle. Be pro-active. Why not purchase that honey as the first step! 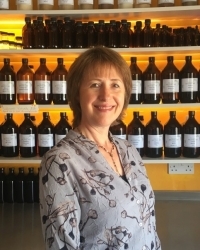 I am a Medical Herbalist practicing out of a beautiful Grade 11 clinic in Westerham Kent.